In keeping with our goal to create more equitable life styles, we work with small rural communities and their schools to upgrade infrastructure and create stimulating and interesting environments. 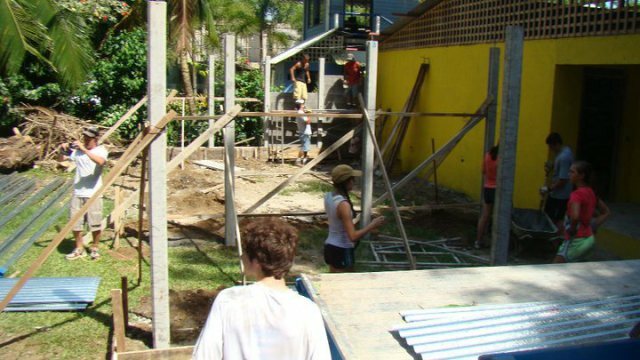 Our youth volunteers are responsible for the building of infrastructure and working with the children in the community by providing them English and creative activities. We have constructed over 400 buildings and upgraded infrastructure for thousands more over the course of the last 15 years with this program. These include clinics, libraries, classrooms, communal centers and housing among others. After construction is complete, we usually furnish the building and provide materials for those who will be using it (furniture, educational materials, shelving). Most schools tell us that they have been waiting years for the Ministry of Education to help them with the infrastructure we complete in four to six weeks. We hope to motivate students in undeserved schools to appreciate the beauty of reading and to have more confidence in this important skill.